In the wake of Osama bin Laden's demise, his likely successor is his longtime deputy and collaborator, Egyptian jihadist Ayman al-Zawahiri. The U.S. government has offered a reward of up to $25 million for Zawahiri, who officials have said was responsible for the planning of 9/11, the bombings of American embassies in Kenya and Tanzania in 1998, and the October 2000 bombing of the USS Cole in Yemen. It remains to be seen whether Zawahiri will be able to recruit and inspire a new generation of jihadists the way bin Laden did. Veteran observers of al-Qaida say bin Laden was a media-savvy, charismatic figure and a good listener. Zawahiri, by contrast, has a record "of alienating his colleagues, fighting over dogma, even within the Islamist movement," said journalist Steve Coll. "And as a communicator, he is less effective. His books are turgid and dogmatic." During a recent online chat with fellow jihadists, Zawahiri sounded "defensive and argumentative. He sounded unappealing as a leader." Shortly after 9/11, Zawahiri and bin Laden appeared together on video discussing the suicide attacks. "This was not just a human achievement. It was a holy act," Zawahiri said. "These 19 brave men who gave their lives for the cause of God will be well taken care of. God granted them the strength to do what they did. There's no comparison between the power of these 19 men and the power of America, and there's no comparison between the destruction these 19 men caused and the destruction America caused." In 1998, Zawahiri wrote in the jihadist journal Al-Mujahidoun that "America is now controlled by the Jews, completely." He added that the United States "uses Israel to attack its neighbors and to slaughter those who are living peacefully there." According to Zawahiri, "If we are a nation of martyrs – as we claim – all that we need is courage of heart and the will of killers and the belief in what we claim to be love of death for God's sake." Born in Egypt on June 19, 1951, Zawahiri came from a family of doctors and religious scholars. His father was a pharmacology professor at Cairo University and his grandfather was grand imam of al-Azhar University, long an ideological center for Islamism. Zawahiri joined the Muslim Brotherhood as an adolescent. He was arrested by the Egyptian government in 1966 for forming an underground Muslim Brotherhood cell. That same year, the Egyptian government, headed by Gamal Abdel Nasser, executed Brotherhood theoretician Sayyid Qutb. "The Nasserite regime thought that the Islamic movement received a deadly blow with the execution of Sayyid Qutb and his comrades," Zawahiri later wrote. "But the apparent surface calm concealed an immediate interaction with Sayyid Qutb's ideas and the formation of the nucleus of the modern Islamic movement in Egypt." Nasser died in 1970, and his successor, President Anwar Sadat, attempted to co-opt the Brotherhood, releasing many of the group's members from jail. They were permitted to preach their doctrine, so long as they didn't resort to violence. They used their new-found freedom to begin laying the groundwork for the overthrow of the Sadat government. Zawahiri graduated from Cairo University in 1974 and went into the Egyptian Army, serving as a surgeon for three years. After leaving the Army, he joined a coalition of Islamist cells calling itself Egyptian Islamic Jihad. He was among scores of militants arrested and tried in connection with Sadat's October 1981 assassination. During the opening day of the trial, Zawahiri said the accused were "the real Islamic front and the real Islamic opposition against Zionism, Communism and imperialism." He said authorities were conducting the prosecution as part of a "conspiracy of evacuating the area in preparation for the Zionist infiltration." Zawahiri was convicted and sentenced to three years imprisonment for illegal weapons possession. He left Egypt in 1985 and went to Peshawar, Pakistan, where he treated mujahedeen fighting the Soviets. That was where he met Osama bin Laden, and the two became close – linked together as "Afghan Arabs." In 1989, with the Soviets defeated and Afghanistan descending into chaos, Zawahiri and bin Laden moved to Sudan. Veteran journalist Lawrence Wright writes that, from his base in Sudan, Zawahiri and his Egyptian Islamic Jihad group launched a bombing and assassination campaign to destabilize Egypt. In 1990, it assassinated Egypt's parliament speaker. Subsequent attacks targeted Egypt's interior minister and other officials. A November 1993 attempted car bombing targeting Egypt's prime minister, injured 21 bystanders , and killed a 12-year-old schoolgirl. "The unintended death of this innocent child pained us all, but we were helpless and we had to fight this government, which was against God's Sharia and supported God's enemies," Zawahiri wrote in his memoirs. The Egyptian government launched a ferocious crackdown after Zawahiri's group tried to assassinate President Hosni Mubarak during a 1995 visit to Ethiopia. Tens of thousands of actual or suspected Islamists were jailed. In retaliation, Zawahiri dispatched suicide bombers to blow up the Egyptian Embassy in Islamabad, Pakistan. The attack by two suicide bombers killed 16 people and wounded 60. By 1996, pressure from the United States and Saudi Arabia forced Sudan to kick out al-Qaida. By 1996, bin Laden, Zawahiri and al-Qaida relocated to Afghanistan, where the Taliban gave them sanctuary. In 1997, the State Department named Zawahiri as a leader of a group called Vanguards of Conquest - an Islamic Jihad faction believed to have been behind the massacre of 58 foreign tourists at Luxor, Egypt that year. Zawahiri has also been indicted in the United States for masterminding the August 7, 1998 bombings of the U.S. embassies in Kenya and Tanzania in which 224 people were killed. In 1998, he joined bin Laden in announcing the World Islamic Front's Statement Urging Jihad Against the Jews and Crusaders. The men issued a fatwa declaring: "We – with God's help, call on every Muslim who believes in God and wishes to be rewarded to comply with God's order to kill Americans and plunder their money wherever they find it." In 1999, Zawahiri was tried in absentia in Egypt and sentenced to death. Tawfiq Hamid, who worked with Zawahiri when the two were part of Jamaa Islamiya, an Egyptian jihadist group, warned against underestimating Zawahiri in his new role as bin Laden's successor. 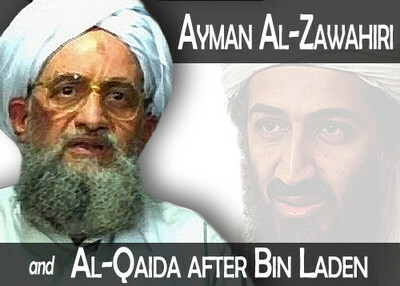 Zawahiri's superior organizational skills and dedication to violence could make him more dangerous than bin Laden. "He's much more powerful as a leader – much more organized," Hamid said. "When you listen to him, you can tell clearly that he has the ambition and is dedicated 100 percent to achieve this mission." If I were th Prez I would try like anything to get the good Doctor in my sights. Once there I would tell the world about Zawahiri so they'd know and care a little maybe, and then I'd get him too. Because some will say oh well he got Osama but that was long in the works and maybe its a fluke anyhow.. But if the Prez ices another bad guy then he comes off as a strong opponent, willing to push the button on a guy and go shoot a round. That would be a good image for him going into the election. The more big terrorist types he can kill the better off he'll be with almost everyone. Naturally it might cost him something with his far left anti-war base, but they aren't going to vote for anybody else anyway, so who cares? Noe, if he would just burn a Koran, he'd be unbeatable!